Immigration policy never seems to be a hot debated issue in Taiwan’s presidential elections. However, population movement between Taiwan and China is considered a serious national security issue. Until now none of the three presidential candidates have proposed a clear picture of migration policy toward PRC Chinese. Here I will talk about Taiwan’s migration policy, and then focus on the possible migration policy change towards PRC Chinese and overseas ethnic Chinese, who are mostly living in Southeast Asia. Currently there is a very complicated immigration system in Taiwan due to its unique political history with China. Residents living outside Taiwan are categorized into 6 groups, which can be basically aggregated into two: foreigners and ethnic Chinese. Such a complex immigration system has developed in different periods in the past 60 years because of the change of political milieu and social change that the Taiwanese government faced. To lure overseas Chinese with ROC passports to come to Taiwan to invest, to study or to visit relatives, so that ROC Taiwan could compete in terms of political legitimacy with the PRC, overseas Chinese are granted a special certificate (Huaqiao shenfen zhengmingshu, Overseas Chinese Certificate), which is only issued to those overseas Chinese who can prove that they or their parents had ever held ROC passports. Overseas Chinese can use this certificate to apply for settlement inTaiwan. About three-quarters of the overseas Chinese immigrants are from Asia. But since the ‘ROC’ was expelled from the United Nations in 1971, and after the US recognized the PRC in 1979, Taiwanbecame a political pariah in the international community. Many Taiwanese moved out this country to seek political security overseas in the 1970s and 1980s. 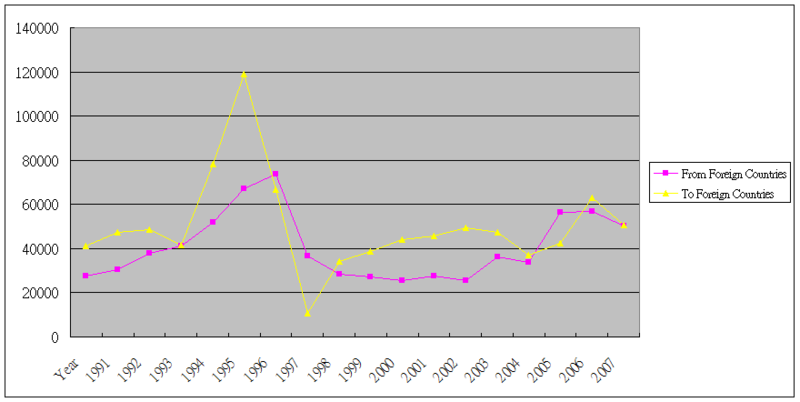 There is no data available for emigration at that time, but Figure 1 below demonstrates that whenever there was a blow to Taiwan’s political stability, the number of emigrants increased, e.g., the Taiwan Strait crisis in 1996 when China launched long-range missiles to intimidate former President Lee Teng-hui. In addition, since the mid-1980s Taiwanese investment in Southeast Asia and China increased enormously, and many people are assigned to work overseas. It is even claimed that there are more than half million Taiwanese living in Shanghai. This creates a new category for immigration control. If these Taiwanese have left Taiwan, and have applied for naturalization in other countries, they will be regarded as ‘overseas Chinese’, but different from the traditional meaning of ‘overseas Chinese’ who mostly come from Mainland China. Basically these overseas Taiwanese have no problem to apply for new passports to return to Taiwan if they can show their old Taiwanese ID card, passport or household registration. Regarding the category for PRC Chinese, mutual exchanges between Taiwan and the PRC were banned before 1985, and there were no mutual visits between the people on the two sides. After 1986, when the Taiwan government relaxed its control of the veterans, who fled to Taiwan with Chiang Kai-shek army, to visit their home towns, exchanges between the two sides increased significantly, including economic investments and personal visits. Marriages between the two sides have taken place since then, and it created a big problem for Taiwan government to accept those ‘enemy people’ to have family unions in Taiwan. It had to abolish the archaic regulations, and in 1997 the law ‘Act Governing Relations between Peoples of the Taiwan Area and the Mainland Area’ (Liangan renmin guanxi tiaoli) was passed to accommodate the new migration situation. This law also applied to people in Hong Kong and Macao. However, the control over PRC Chinese is harsher than for foreigners due to the ideology of national security. So currently there are two laws to regulate marriage immigrants, one is the law for PRC Chinese, while another is for all other foreigners. The most important ideology that sustains immigration policy in Taiwan is the patriarchal jus sanguinis principle, which dominates postwar Taiwanese immigration policy. As discussed previously, political rivalry between the PRC and ROC created a specific immigrant category for overseas Chinese. It is based on a jus sanguinis principle, and this principle has not changed too much until now. It was patriarchal because before this revision of the Nationality Law in 1999, only descendants of male ROC/Taiwan passport holders could apply for naturalization. Any marriage immigrant before naturalization without attachment to a Taiwanese national, either spouse or child, has to leave when the temporary residency permit expires. This practice supports the patriarchy family ideology in Taiwan, since most permanent settlers are women from China and Southeast Asia. Another key concept of Taiwan’s migration and citizenship policy is ‘population quality’ (renkou suzhi) and the categorization of individuals and migrants as being of lower or higher quality. The mission of the Taiwanese government is to ensure the reproduction of a good quality population, while preventing any contamination of low quality population coming into the society. A ‘Population Policy Committee’ was set up in the 1960s, which still remains an important body in the Ministry of Interior, to direct the policy to reproduce a ‘good quality’ population. Taiwan’s government explicitly states that it will attract ‘high quality population’ to work and to settle down as it states in the ‘Guidelines for 2009 Policy Implementation’ that ‘the government will improve the effectiveness of border control, prevent human trafficking, formulate a consistent policy to prosecute, protect and prevent human trafficking, and to actively attract overseas high quality persons’. The third characteristic of Taiwan’s migration policy is the emphasis on ‘national security’. Since the defeat of KMT in 1949, Taiwan was built as the bastion to fight against Communist China. Population movements were regarded as threatening for national security, so they needed to control them. Such a principle is especially applied to PRC immigrants, who could be denied entry into Taiwan at Taiwan’s airport if they are considered potential threats to the national security. Chinese immigrants are not allowed to work before they get the permanent residency status, which takes about six years to acquire. Even when they are naturalized, they are suspected to be communist Chinese spies, and are not allowed to be civil servants within the first ten years of naturalization. The principles of Taiwan’s immigration policy have not changed very much in the past few decades, and it still dominates the ways of thinking about migration in Taiwan. 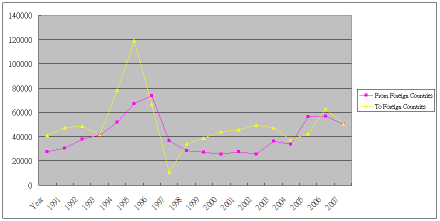 The major immigration policy changes made in the past are due to international political changes, which are strongly related to the China factor, and domestic social pressures. In the near future, we can foresee some changes that might be made. First of all, the China factor will strongly influence Taiwan’s immigration policy. Current migration policy toward Chinese spouses and foreign spouses is discriminatory, and a strong pressure comes from China and domestic NGOs to have equal treatment between these two groups. Especially the new government in 2008 led by President Ma Ying-jeou is heavily tilting to China, and it has relaxed the ban of Chinese students to study in Taiwan after 2012, who will be very likely to settle down in Taiwan after the graduation and become permanent migrants. In addition, the short-term de-sinicization process between 2000 and 2008 by former President Chen Shui-bian is reversed after the new government, and a relaxation on the immigration of overseas Chinese is underway. More overseas Chinese would be able to apply for immigration in the coming years. It also means that the ‘national security’ principle will be down played, while the jus sanguinis principle, the imagined Chineseness, will again be enforced. One piece of evidence is the number of approved overseas Chinese to settle down in Taiwan increased from17,000 in 2007 to 31,000 in 2009. I still don’t know how the migration policy would be changed if Dr. Tsai Ing-wen wins the election, but the Chineseness might be again downplayed, and more resources might be directed to local cultural affairs like aborigines. What will be kept intact is the ideology of ‘population quality’. This principle applies to all foreign residents, no matter what ethnicity they are. Scholars who did research on population policy in 2007 subcontracted by the Ministry of Interior say nothing about blue-collar immigrants in Taiwan, and the reason is ‘the government declined to put migrant workers policy as a part of population policy’. However, this report put much effort in formulating policy to attract ‘high quality human resources’. In other words, the government will keep its strict control on marriage immigration and labor migration. Dr Wang Hong-zen is Professor and Chair of the Graduate Institute of Sociology, National Sun Yat-sen University.